The DCHBW75 series of DC/DC power converters provides up to 76.8 Watts of output power in an industry standard half-brick package and footprint. This series consists of single output models ranging from 3.3VDC to 48VDC with 4:1 ultra wide input voltage ranges of 9~36VDC, 18~75VDC and 43~160VDC. Some features include high efficiency up to 90%, adjustable output voltage, positive remote on/off control, and under voltage lockout. These converters also have short circuit, over voltage, over current, and over temperature protection. 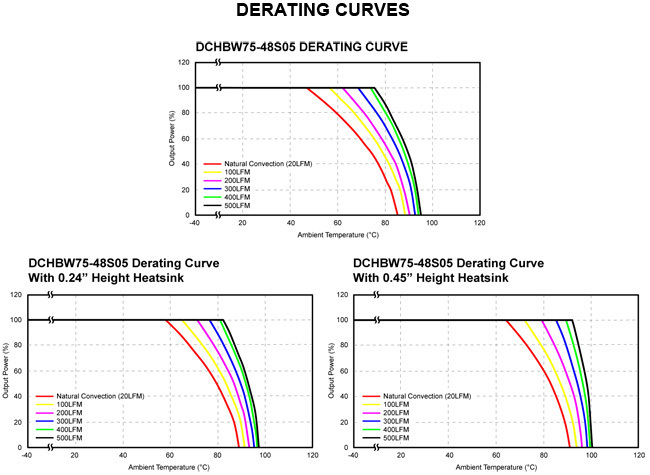 The DCHBW75 series is RoHS compliant and has UL60950-1, EN60950-1, IEC60950-1, and EN50155 safety approvals (safety approvals pending for 110VDC input models). 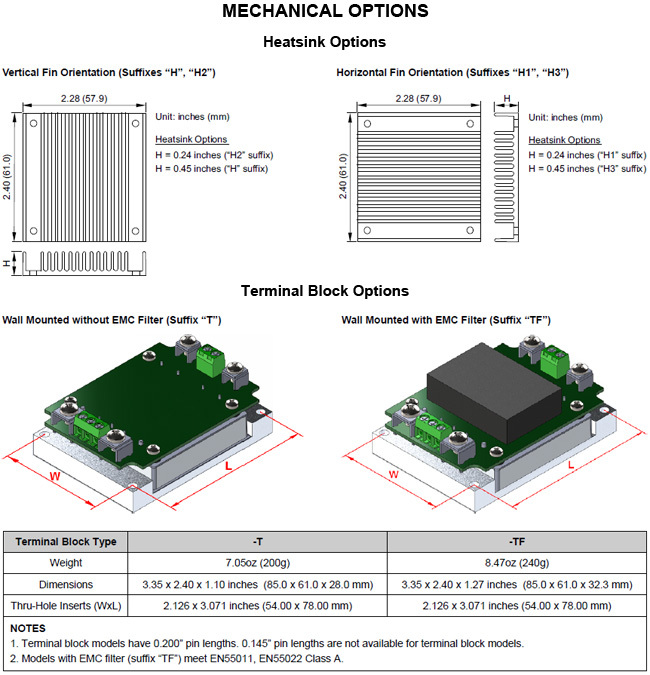 Several different options are available for this series including negative remote on/off, terminal block, pin length, heatsinks, and thru-hole inserts. Please call factory for more details. (2) Test by minimum input and constant resistive load. (3) Typical Value at Nominal Input Voltage and Full Load. (4) Input source impedance: The power module will operate as specifications without external components, assuming that the source voltage has a very low impedance and reasonable input voltage regulation. Highly inductive source impedances can affect the stability of the power module. An external input capacitor is recommended for 24VDC nominal input models. We suggest 4.7µF/50V X7R MLCC or Nippon chemi-con KY series, 68µF/100V, ESR 110mΩ or better capacitor. For terminal block versions, the capacitor is included as standard and an external capacitor is not necessary. (5) Output voltage is adjustable for 10% trim up or -20% down of nominal output voltage by connecting a single resistor between TRIM and +SENSE pins for trim up or between TRIM and –SENSE pins for trim down. To calculate the value of the resistor RU and RD for a particular output voltage see page 5/6. (6) Maximum output deviation is +10% inclusive of remote sense and trim. If remote sense is not being used, the +SENSE should be connected to its corresponding +OUTPUT and likewise the –SENSE should be connected to its corresponding –OUTPUT. (7) The CTRL pin voltage is referenced to –INPUT. To order negative logic remote on/off control add the suffix “R” to the model number. 2. Heat sink is optional. See the “Product Options” table for suffix options. 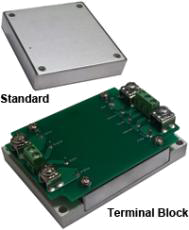 (9) The standard module meets EMI Class A or Class B with external components. 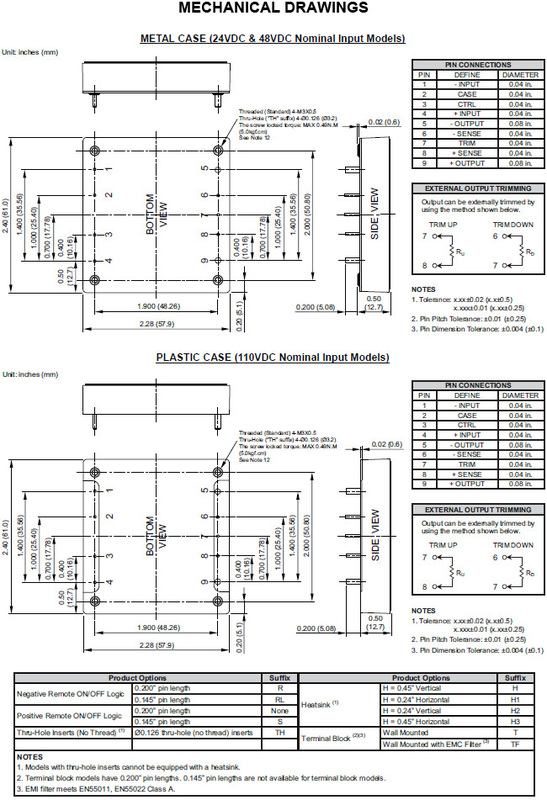 (10) An external input filter capacitor is required if the module has to meet EN61000-4-4, EN61000-4-5. For 24 & 48VDC nominal input models, we recommend connecting one aluminum electrolytic capacitor (Nippon chemi-con KY series, 220µF/100V, ESR 48mΩ) in parallel. For 110VDc nominal input models, we recommend connecting three aluminum electrolytic capacitors (Ruby-con BXF series, 100µF/250V) in parallel. (12) This series comes with several different options: Negative remote on/off control, heatsinks, pin length, thru-hole inserts, and terminal blocks. See the “Product Options” table on page 6 for more ordering information. (13) CAUTION: This power converter is not internally fused. An input line fuse must always be used.